Arrive in the afternoon in M’Hamid el Ghizlane by your own transportation. If needed, you may leave your car at our office in M’Hamid. 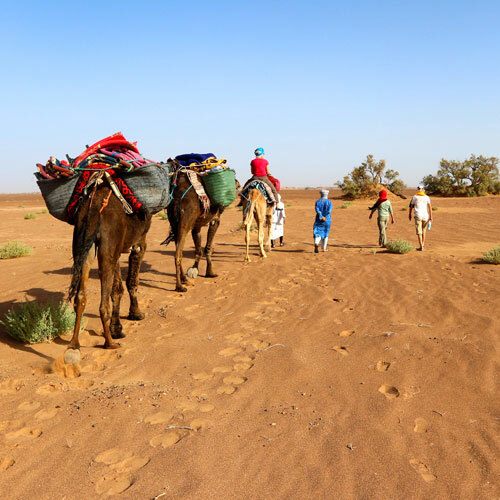 Depart by camel through the last oasis of the Draa Valley and the first dunes of the Sahara. Arrive at the bivouac south of the village of M’Hamid in time for sunset over the high dunes. Traditional nomad dinner and night under the stars or in nomad tents. After watching sunrise over the dunes and a traditional nomad breakfast, trek (either on foot or by camel) to the ruins of Sidi Bousnina via Reg el Arada. Enjoy a picnic lunch during your hike and a traditional nomad dinner. Spend the night at in our mobile nomad tents near the ruins of Sidi Bousnina. After a traditional nomad breakfast, trek (either on foot or by camel) to the dunes of Erg Elboua. Enjoy a picnic lunch on the dunes and continue to Erg Ait Ounir. Enjoy a traditional nomad dinner and spend the night at in our mobile nomad tents. After sunrise over the dunes and a traditional nomad breakfast, trek (either on foot or by camel) back to the bivouac through Nkhill Rass. Sunset over the dunes followed by traditional nomad dinner and night under the stars or in nomad tents. After a traditional nomad breakfast, return to M’Hamid and your vehicle.